There’s always one story worth revisiting, so for today’s story we’re going back to December 2017. 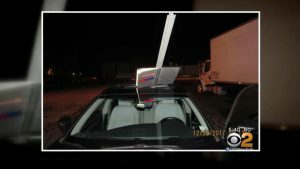 In South Hackensack, NJ – which is just a few minutes from SafetySign.com’s headquarters – Police Officer David Polanco was patrolling Route 46 around 1:00 a.m., when he spotted a black sedan travelling with a traffic sign protruding from the sunroof. As Polanco was about to pull the black sedan over, the driver, 52-year-old Maria Vazquez, of Hawthorne, NJ, pulled into a diner. The reason for her sudden stop, “. . .she heard a strange noise coming from underneath her vehicle.” Yes, you read that correctly. The driver pulled over, not because she had a Traffic Sign lodged into her sunroof (missing her head by mere inches), but because she thought she heard something in her undercarriage. Police said Vazquez failed two sobriety tests and a breathalyzer reading. When asked about the sign, she didn’t even know it was sticking out of her car. Earlier that night Vazquez had been drinking in neighboring town Seacaucus (about 8 miles from where she was pulled over) and it’s believed that is where the sign was from. However, to this date, how the sign actually ended up in her car is a complete mystery. Vazquez was charged with driving while intoxicated. That concludes another edition of throwback Thursday.